Determining the exact focal length equivalent of the human eye is a matter of debate, but our natural field of view correlates well with what we can photograph using moderately wide to mild telephoto lenses. For the most part, what we see is what we get with lenses in these categories, and they therefore provide photographers with a relatively straightforward route to finding compositions. Going much wider or longer will depart substantially from our natural field of view and can introduce complications, which is why many photographers will caution beginners against using less traditional focal lengths for landscapes. In order to use nontraditional lenses most effectively, it is helpful to understand the advantages that they offer as well as the particular challenges that they pose. Reunion (24mm, Canon EF 16-35mm f/2.8L II) - Traditional focal lengths for landscape photography provide a comfortable correspondence between casual viewing experiences and looking through a lens. Taken from a standing height at 24mm, this photo depicts the location much as any bystander might see it. 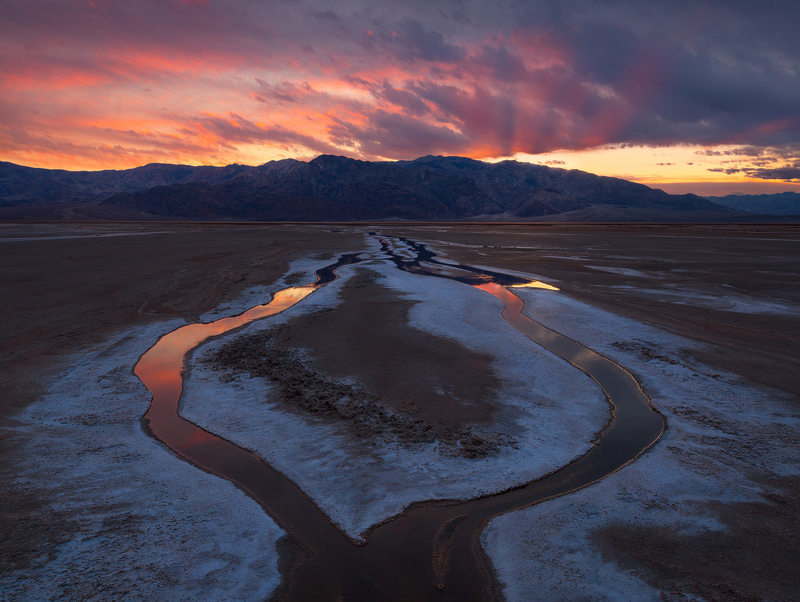 What most interested me about this scene compositionally was the way that this large salt creek split into two channels that meander away from each other before converging and snaking off towards the mountains together. The greatest area of interest started about 10 feet in front of me and extended into the distant middle-ground, so I chose a moderately wide focal length to put the emphasis on these transitional areas. The primary advantage of wide-angle lenses is their ability to take in more of the world around us, but with that expansiveness comes the possibility of including a variety of competing elements that can result in a busy composition quite easily. At ultra-wide focal lengths, we even run the risk of taking in everything from clouds overhead right down to our own feet, so lenses in this category typically require a substantial amount of practice in order for a photographer to become accustomed to composing with them. At the other extreme, very long focal lengths run the opposite risk of excluding too much from a view, causing a composition to look incomplete or to lack impact. Moreover, the distant compositions that telephoto lenses bring forward are simply more difficult to see without using the lens, making it easy to overlook opportunities or to miss a change in light that might call for an adjustment to the framing. Understanding these caveats is essential to turning potential problems into opportunities. Despite their challenges, extreme focal lengths do have some very desirable advantages for those of us who are willing to look more closely at features either near or far. Lenses that can go very wide or very long open up a world of options for emphasizing the way that we tend to experience an outdoor environment and what we find most interesting about it. Although our eyes do have a fixed field of view at any one position, they are never fixed; they are always scanning, tracking, and adjusting as we observe our surroundings and move around within them. All of this visual input gets processed according to what we find most interesting, and our minds will make connections or ‘think away’ distractions as our experiences unfold. Sundial (20mm, Canon EF 16-35mm f/2.8L II) - A focal length of 20mm is about where a lens begins to exaggerate foreground elements, especially if it is angled downward. The horseshoe shape in this photo was much less visible from a standing height and at longer focal lengths. By lowering my tripod to about waist-height and going wider with my lens, I was able to emphasize the broad, arcing forms of the cracks in this section of mud tiles without compromising the wonderful patterning of tiles receding deep into the distance. Anyone who has knelt to admire a wildflower up close can visualize the features of additional specimens further away, even if the flowers appear only as mere specks of color, because the mind will make the necessary associations on the fly. Unfortunately, many photographers learn the hard way that those same flowers might not seem nearly as interesting or as important when they appear as distant bits of color in a photograph. On the other hand, a photo that shows only a close view of some flowers misses out their context. By using a wide-angle lens, we can put the experience of seeing both near and far back together again for the viewer, thereby providing an impression of a place that is more immersive. Conversely, our minds have a tremendous ability to focus in on a distant feature while subconsciously excluding much that is within sight. Telephoto lenses work much in the same way, showing viewers what we find interesting or important. Therefore, even focal lengths that fall far outside the most ‘natural’ range for our eyes can still produce photographs that are very rooted in relatable experiences of viewing and offer some wonderful creative options for visual storytelling. 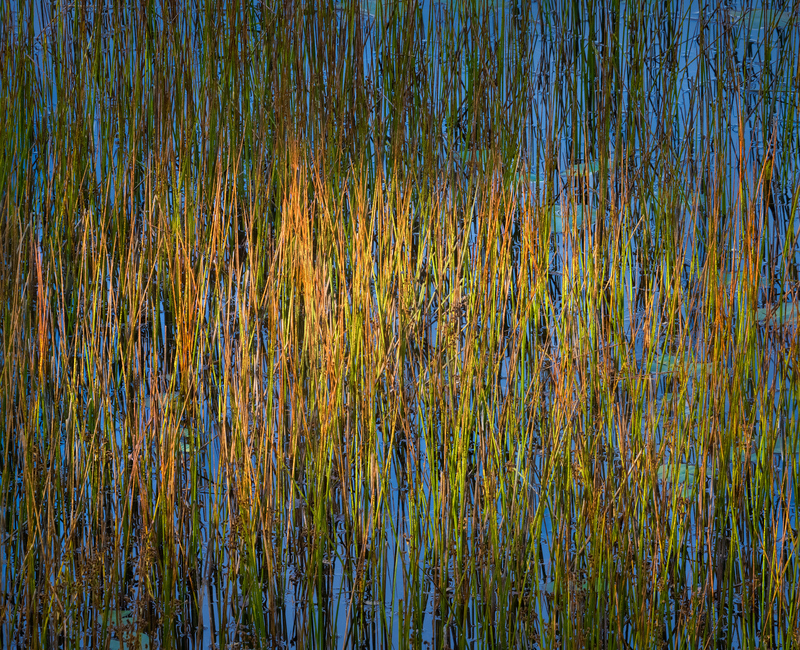 Broad Brush (330mm, Canon EF 100-400mm f/4.5-5.6L II) - Dappled light playing across this pond caused the sunlit reeds to remind me of flames, while the textures and bold colors were evocative of thick impasto on the surface of an expressionist painting. A very long focal length of 330mm allowed me to exclude context and to compress space considerably, thereby emphasizing the abstract qualities that I was seeing. Ordinarily I would not be optimistic about trying to shoot a focus stack with so many features that could show some movement between frames (which causes problems with alignment in the stacking process), but I decided to try it and test my luck. To my great surprise, it actually worked. This image is a focus stack of two frames at 1/50th sec, and miraculously, nothing moved between shots. Although the term ‘wide-angle’ implies that width is the defining characteristic of this category, more often than not, it’s the ability of such lenses to suggest depth that makes them shine. The idea that wide-angle lenses work well for panoramic vistas makes intuitive sense, but using them for this purpose is far from straightforward. Indeed, a wide focal length can provide a sense of horizontal expansiveness, but it also expands a scene’s depth from front to back. A very wide focal length tends to place a strong emphasis on the area immediately surrounding the photographer, so if that area is not a compelling part of the visual ‘story,’ then it will appear extraneous and will detract from the areas where the real interest lies. Oftentimes the most effective choice for emphasizing a landscape’s panoramic qualities is to photograph it as a panorama, shooting a series of frames at a ‘normal’ focal length with the goal of producing a ‘stitched’ image in a wide aspect ratio. Rhapsody in Blue (16mm, Canon EF 16-35mm f/2.8L II) - I find that 16mm is a very versatile focal length, allowing for a dramatic amount of foreground emphasis with the camera at a standing height or lower. Angling a lens downward at this focal length tends to cause lines in the lower corners of the frame to incline outward diagonally, an effect that I use a lot to provide a foreground with greater dynamism. The tendency of very wide focal lengths to emphasize a foreground is hardly a reason to avoid using them, however. On the contrary, wide focal lengths—especially extremely wide ones—allow us to make creative use of relatively small features of a landscape in order to give a sense of context to a scene. When brought close to the front element of an ultra-wide-angle lens, small features become exaggerated in scale relative to the background, enabling them to contribute substantially to the composition and to the ideas or story that the photograph may suggest. As long as we think in terms of putting the foreground into play as an important zone of interest, then the results can be very compelling. Typically with very wide focal lengths, that zone of interest will be on the ground near where we are standing, so it is often an effective choice to get low with a wide lens. Because extremely wide focal lengths such as 11mm provide a great depth-of-field at most apertures, they enable us to focus very closely without giving up acceptable sharpness in the background. The impression of a so-called “near-far” composition with sharpness throughout the scene can be highly immersive, giving viewers a great sense of presence and immediacy. Enigma (11mm, Canon EF 11-24mm f/4L) - The most extreme wide-angle focal lengths are excellent for emphasizing very small details close to the camera. The wonderful textures of this surreal desert floor would be difficult to understand and appreciate if they appeared small in the frame. 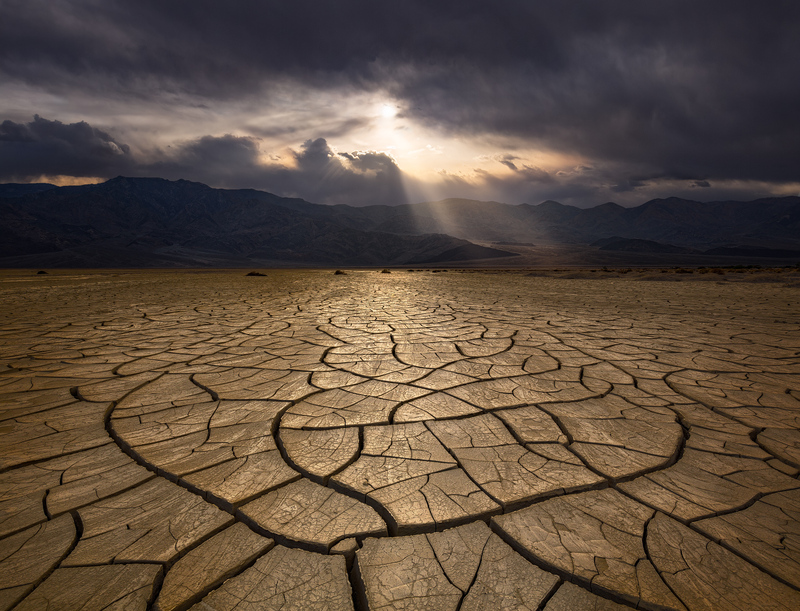 By using a focal length of 11mm, I was able to enlarge the mud tiles closest to me while also showing the mountains that provide the scene with some interesting context. Another great benefit of ultra-wide focal lengths is often said to be one of their pitfalls, namely the tendency of these lenses to stretch or distort forms when the lenses are not leveled. The Canon 11-24mm f/4L lens is a great example in this regard, being a lens that is uniquely rectilinear despite its very wide focal length range, and yet one that has a wonderful ability to stretch features when it is used ‘improperly.’ Although it has amazing utility as a rectilinear lens, I personally enjoy using it oriented off-axis in order to force some distortion out of it at the very edges of the frame, thereby causing foreground lines to splay out in dynamic diagonals. The same technique works to provide even more enlargement of small features near the lower edge of the lens or even to give a mountain peak near the top of the frame a little extra prominence. Arrow Dynamic (14mm, Canon EF 11-24mm f/4L) - By using the EF 11-24mm f/4L lens at about knee height and angled downward, I was able to force some distortion out of the lower edge of the lens, thereby stretching the foreground just enough to give the closest flowers and ripples more presence in the frame. 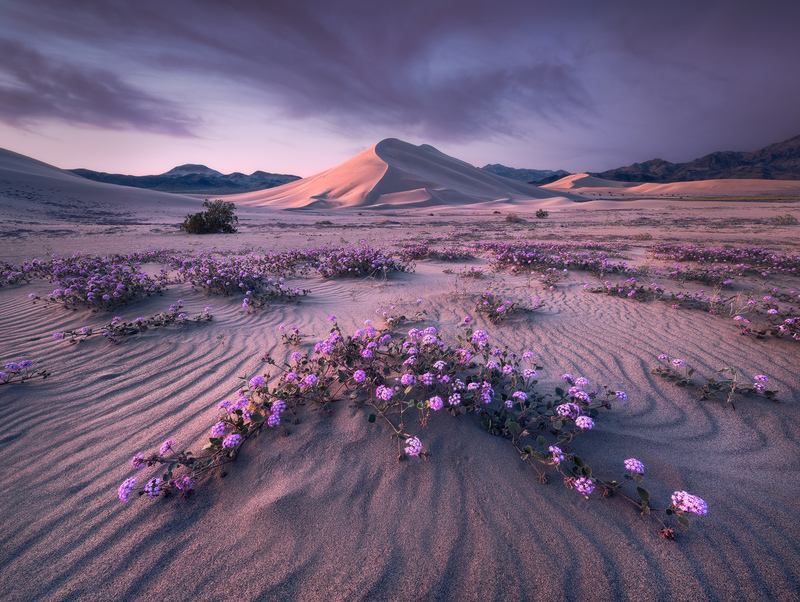 This intentional distortion helped me to emphasize the arrow-shaped grouping of flowers and their correspondence with the form of the prominent, sunlit dune. A focal length of 14mm provided a nice balance in proportions between the closest flowers and the ones in the middle-ground, which allowed all of the repeating elements to transition the eye smoothly towards the background. While the term ‘telephoto’ suggests an emphasis on features that are far away, these focal lengths are useful for photographing nature both near and far. Their primary benefit is providing a means of exclusion, allowing us to emphasize a slice of the world around us rather than taking it all in. That slice may be two meters or two miles away, but in either case, the use of a telephoto lens provides the option to pick out some little vignette of nature that can stand on its own in communicating something about what makes an environment special to the photographer. Like a minor narrative within a great epic poem, these snippets of a location develop its character, provide salient details, and encourage contemplation. Rather than giving the big picture, they provide the finer points, and context may become an alluring matter of mystery. 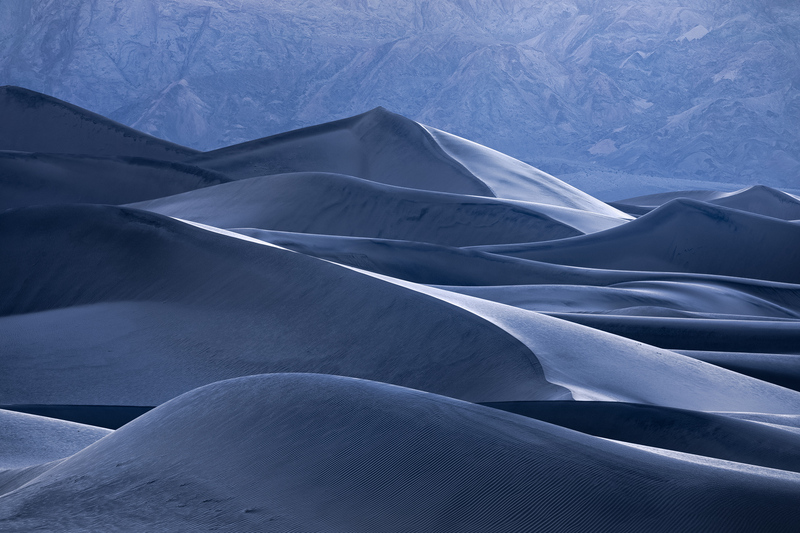 Silver Lining (349mm, Canon EF 100-400 f/4.5-5.6L II) - From this vantage point, the many layers of these sand dunes aligned to form a dynamic zigzag of lines running up the center of the frame. With my lens set to 349mm, I was able to exclude nearby features that would have detracted from what I found most interesting about the view. The great compression provided by such long focal lengths is ideal for emphasizing contour lines and layering, both of which give this scene its appeal. Telephoto focal lengths become more extreme for landscape photography as they exceed 200mm or else when shorter telephoto lengths are used near to the minimum focusing distance of the lens. In either situation, the potential problems mentioned above become more acute, and depth-of-field becomes more difficult to manage. Nonetheless, the very same issues that produce these challenges are also what provide the potential for using extreme telephoto lenses to creative effect. Beyond the simple premise of exclusion, the aesthetic benefits of telephoto lenses include the ability to compress layers of features into striking patterns and graphical forms that play up contour lines and grand structures. Whether these layers lie miles or just inches apart, the right combination of distance and alignments can bring out patterns and shapes that would not otherwise be visible. Sometimes stopping down the lens can be a satisfactory means of achieving acceptable depth-of-field with more extreme telephoto compositions, but I often prefer to opt for focus stacking instead. Not only does focus stacking enable the use of apertures that incur less diffraction, but it also can further heighten a sense of compression and thereby emphasize graphical qualities in a scene. The technique involves shooting the same composition at a series of different focus points and then merging them in Photoshop® or a dedicated stacking program, a process that is quite simple to master with a bit of practice. 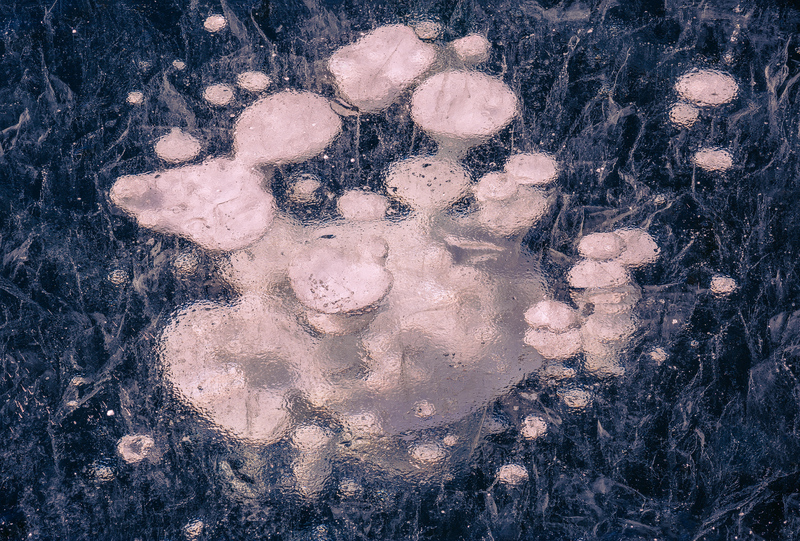 Frizzante (160mm, Canon EF 70-200mm f/4L IS) - These bubbles in the ice of a frozen lake were only about two meters away from me, but I used a relatively long focal length of 160mm in order to isolate a small grouping of bubbles and to bring out the patterns around it. Stopping down the lens a lot might have given me enough depth-of-field to have acceptable sharpness throughout the image, but very small apertures also introduce softness through diffraction. Therefore, I chose to shoot this little vignette of nature at f/11 and with six different focus points so that I could later merge those frames together into a single focus-stacked image. 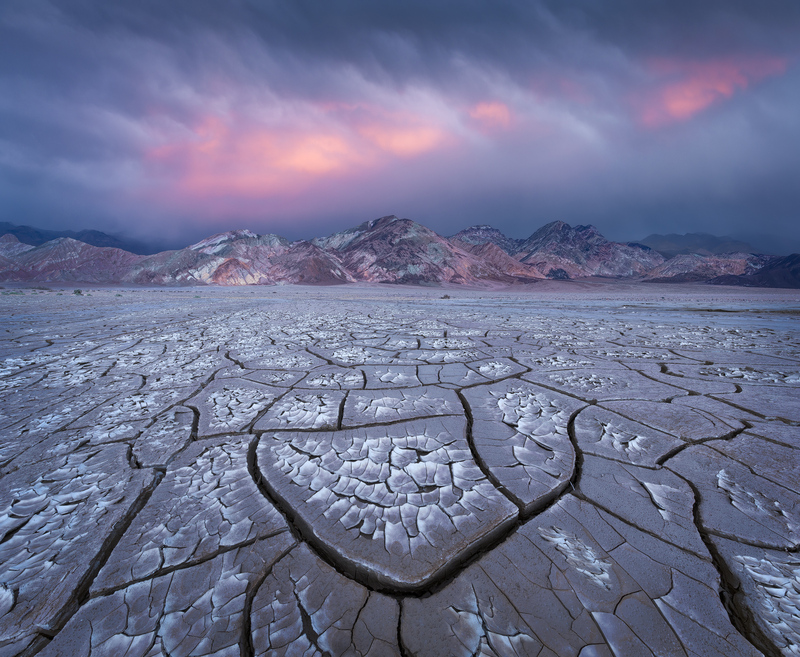 Working with extreme focal lengths for landscape photography can require some extra effort in both the composition and the development of a photograph, but the rewards are many. 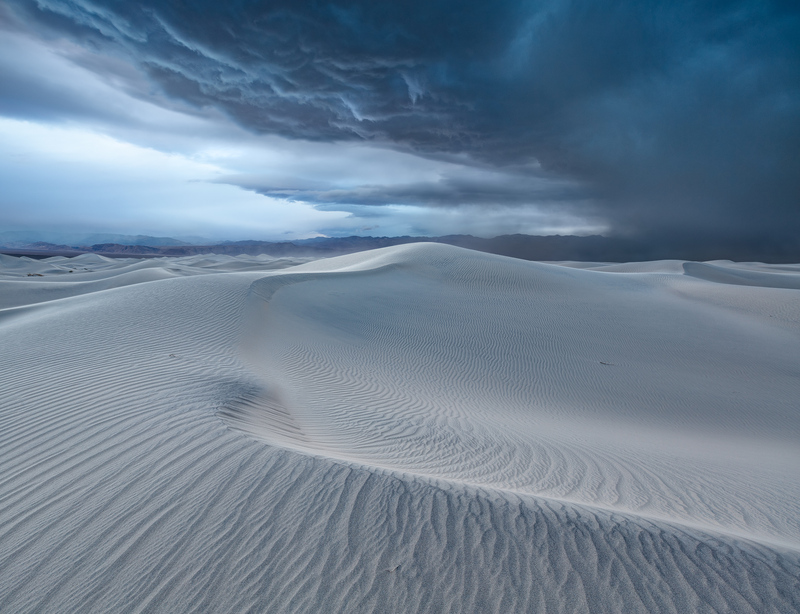 Not only do they open up a wealth of options for finding compositions at any given location, but extreme focal lengths also can produce emphatic visual effects that result in especially compelling images. Above all, embracing these extremes can expand the potential for expressing what we find important about the environments that we visit or what we find meaningful about our experiences within them. Beyond the limits of tradition lies a world of creative opportunity.